My smart little girl is graduating from her Pre-K Owl class at St. Barnabas EEC. The school was amazing. Her teachers were awesome and she learned a lot. Today was her last day of class and she came home with a notebook she kept in school during the year where she practiced writing her letters and numbers, and wrote interesting things about what she had learned and about herself. It was an interesting year. Her original teacher left for a full time job at an elementary school. 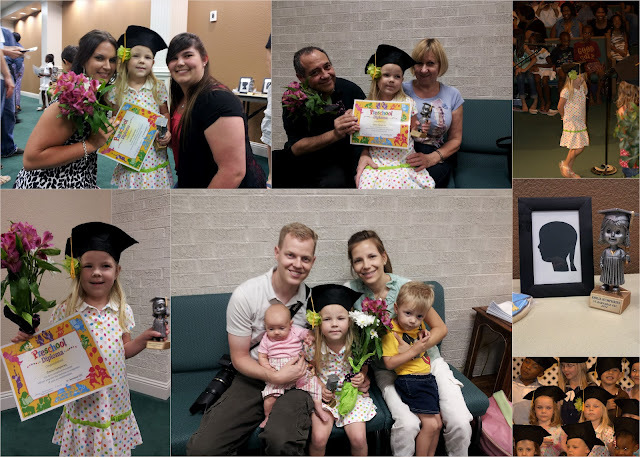 After the tornado hit and they had to relocate to Tate Springs Baptist Church her class was split and assimilated into two other 4 year old classes and her second teacher Ms Krista spent half of her time with Emilia's new class and the other half with the rest of her other students. In the end Emilia got to be in Ms. Lindsey and Ms. Jessica's class. They were Claire's (Emilia's best friend) teachers last year and told Emilia how much Claire had talked about her to them then. Emilia adjusted quickly to the change and made a whole new group of friends. Ms. Krista commented on how Emilia's personality became more outgoing after the change. She used to be in a class of eight kid, now she is in a class of 15. She soon realized she needed to be more outspoken if she wanted to be heard and so she did. Emilia has learned much while at St. Barnabas and is ready to tackle a new adventure in the fall. I'm not quite sure I'm ready for the change. I think Todd will have to be the one who takes her to her first day of school. But I still have a whole summer to get adjusted to the idea. Class of 2030 here she comes!